Lana Del Rey Loves Kendrick Lamar, And Other Highlights From Coachella Weekend One : The Record High-wire acrobatics, major guest performances, a new Lorde song and dozens of stolen cell phones highlight the final night of the festival's first weekend. 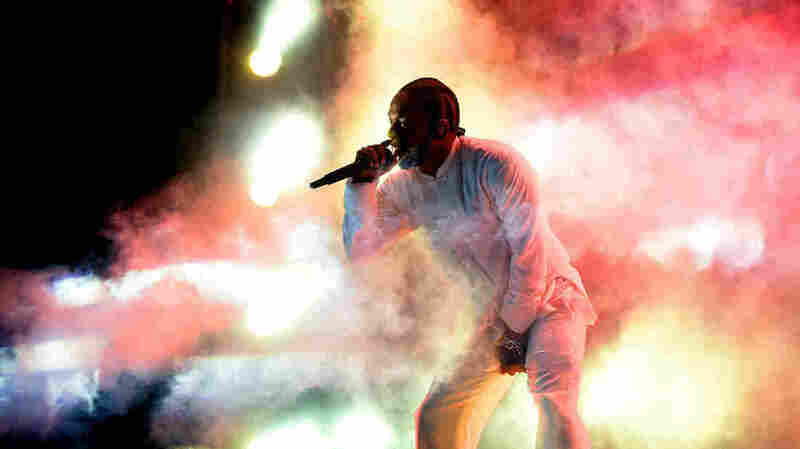 Kendrick Lamar performs on the Coachella Stage during the Coachella Valley Music and Arts Festival in Indio, California, Sunday night. Kendrick Lamar's victory lap continues. The rapper closed the first weekend of the Coachella Valley Music and Arts Festival Sunday night — like most Coachella performers, he'll return at the same time next weekend — with a set that blew through social media thanks to live-streaming and widespread interest in his new material. Lamar's intensely anticipated new album, DAMN., came out Friday (stream it here), and live debuts of its songs highlighted and bookended his sprawling, career-spanning, 19-song set list. As they are with DAMN. itself, fans are still digesting Sunday's performance, pieces of which are scattered across the Internet via YouTube footage. Given the setting, high-profile guests (including ScHoolboy Q, Future and Travis Scott) were a given, but fans were also treated to high-wire acrobatics and an appearance by the "Kung Fu Kenny" alter ego who pops up throughout DAMN. Reviews of his set have been effusive, while footage of Lana Del Rey enjoying the set went momentarily viral overnight. In other first-weekend news, Lorde premiered a new song called "Homemade Dynamite" and briefly covered Kanye West's "Runaway." Someone (definitely not Lorde) was arrested for allegedly stealing more than 100 cell phones. Drake accused a country club of racial profiling on Instagram before deleting the post. So what will next weekend's Coachella bring, besides most of the same performers and hopefully not quite so much pick-pocketing? Stay tuned.